Macabre Faire Grimm Gathering Halloween Extravaganza in Rockville Centre, Nassau County, Long Island, New York. Macabre Faire Grimm Gathering Halloween Extravaganza at the Best Western Mill River Manor in Rockville Centre, Long Island, New York. 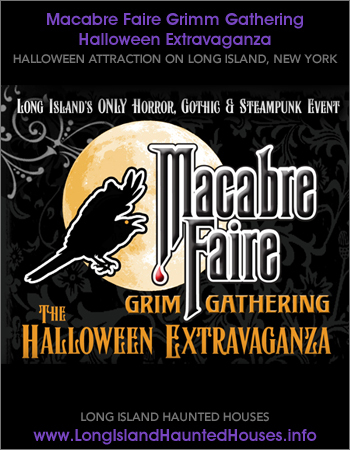 Macabre Faire Grim Gathering is one of Long Island's ultimate Halloween attractions. Featuring celebrity appearances, a fashion show and a new haunted play brought to you by Twitch Twitch Productions. Come in costume, or come to check out some of the craziest costumes you might ever see. This even is meant to be a safe, family Halloween event, prefect for all ages with no-scare haunted houses, trick-or-treating, arts and crafts and a costume contest and much more. A cash bar and food menu is available. At Twitch Productions, we accommodate those who love the scare ... The thrill ... The unknown ... and the entertainment provided by experiencing something outrageously different than the norm. We provide unique theatrical productions, films, events, radio, videos, original music and live character appearances for all types of events.